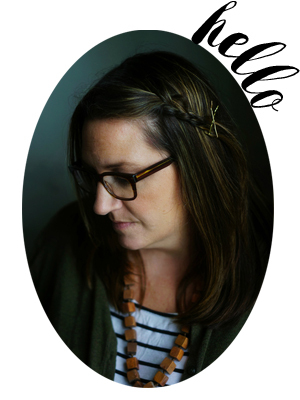 Anyhoo, leave it to Lotta to come along and inspire me some more, and to get my wheels turning once again when it comes to documenting, savoring, and saving my "work" in the kitchen. 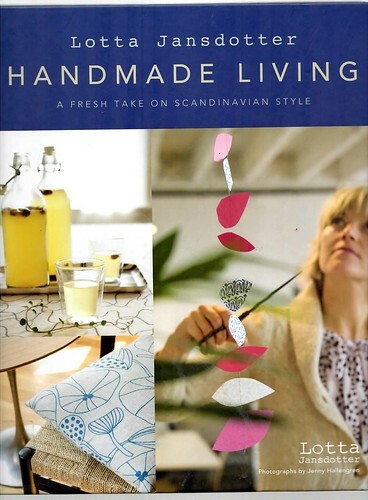 If you have not yet cracked the pages of her Handmade Living book, do yourself a favor and get your hands on a copy. In fact, if you're anything like me, I should have simply purchased the book to begin with instead of paying all fines for the multiple times I have checked it out of the library…. Every page is full of inspiration and ideas. But one that has stuck with me these past few weeks is her recipe journals–clipped recipes, hand-written notes, ideas, sketches. I love everything about this idea. 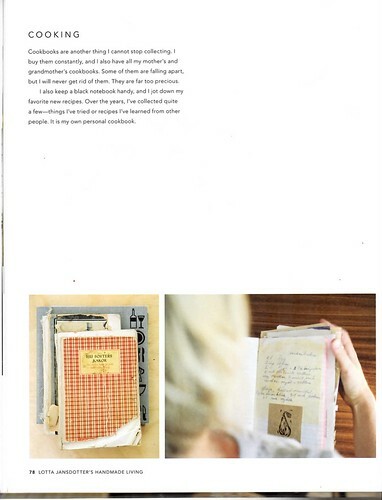 And I love the idea of a shelf full of years of kitchen journals. What about you–do you keep something similar to this? How do you record your work in the kitchen? 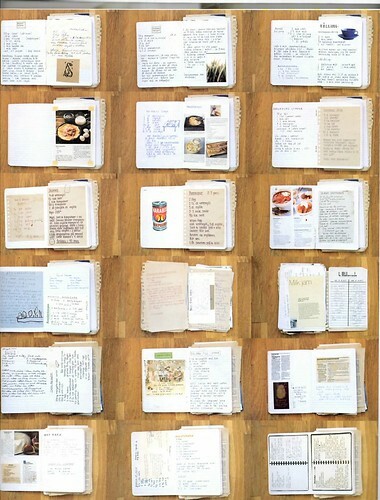 I recently discovered this: http://www.moleskine.com/msk.php…which seems great for printing blogger recipes and such to fit your very own moleskin…pretty neat. the closest thing i do is *occasionally* make notes in recipes about when i made them (especially if it was for a special occasion). but i LOVE this idea. I have a 3 ring binder with recipes stuffed in page protectors. This works for me because I can add recipes that I find in magazines (without having to keep the whole issue) or online easily. I do make notes when I substitute ingredients or change amounts too. This is the only thing that works for me. I don’t have time to transfer recipes to index cards! I do have dividers for appetizers and desserts, but the main dish meals are all in one big secton. I was recently thinking about putting all of my recipes into a moleskine. Right now I make notes in my cookbooks. I also have a large journal that hold family recipes, but I would rather it be a more accommodating size. I use photo albums. That way I can reorganize the recipes. You can also slip clipped recipes in, and the plastic protects them. My friend Rob has his mother’s cookbook collection. It’s not a large collection, but she died when he was 16, and he’s a real foodie, so they’re really meaningful to him. The most special thing about her “go-to” cookbook is the notes she made inside the covers and on the lining papers. She recorded each dinner party she hosted, included the date, who was there, and each food/drink item that was served. It’s entirely fabulous. Like really, truly fabulous. I have tons of cookbooks, and no one to pass them on to, but I’ve developed a similar habit for the books I use often. When I use a recipe I make a note beside it with the date, occasion (if there was one), how the recipe turned out and any changes I’d make. It’s become a lovely record for me, and I never fail to smile when I flip open well-used pages. I have a Carl Larsson blank book that I have been adding all our family favorites to (I even blogged about it 🙂 – http://mommymadeinminnesota.blogspot.com/2011/01/my-collection-of-favorite-recipes.html). I too envision it as a family heirloom. My mom has a silver blank book that has all her favorite baking recipes in it and she still refers to it. I really like the idea above though and think I may need to start expanding my book. I just put this book on hold at the library:) I currently have a jumble of items thrown into a recipe box, not very organized or pretty! It might be the time for some updating. . .
What a wonderful treasure for your friend! Fabulous is the word, for sure! i keep mine in a three ring binder. but it’s not working. This is an idea that’s just calling my name!! I keep my recipes in an old file folder. Or I should say the recipes that don’t spill out the sides or get left on the counter and thrown away as trash. Can’t wait to get my hands on this book! dang. now i want another new book. also, i keep a three ring binder with dividers and page protectors for recipes. ones i print off the computer just get punched and put on the rings, small clippings or newspaper/magazine ones get slipped into sleeves. i love it. I don’t, but I have my grandmother’s that is very similar to this…newspaper clippings, photos, notes like “tasted too sweet” or “really serves only 4”. So great! That recipe journal looks amazing!!! And, thanks for the book tip. I immediately went and added it to my library hold list. I have a very messy three ring binder with nothing actually bound in it! It’s just a stack of printouts, clipping and handwritten notes. The binder has all sorts of dividers that I do not use. It is the beginning of something organized, but it’s totally not. Oof. I have all of ten recipes written down (save for those i record online). But for what it’s worth, I also ogled this part of Jansdotter’s book. And dog-eared it. Along with those awesome cloth kleenex box beauty covers. I got a moleskine recipe book for my birthday last year (i have still to transfer the recipes into it though!!) it looks pretty similar to the picture from the book. Yes – I started my book when I began University. Volume one is a small plain utilitarian notebook, but inside it is almost like a diary of my life, charting the food phases from simple student fare, through things I learned when we lived in Japan. Recipes I had to call my mother to describe from my childhood and jotted down and things I clipped from magazines and newspapers. I filled it up last year and have just begun volume 2. It’s still a bit new, but I have a feeling it will become an old friend too. My only rule about making it into my book is that I have to have cooked and liked the dish. Stuff I have clipped, but not yet tried lives in my kitchen drawer until it has been auditioned! Love ur book a lot and its very usefull too..What a Excellent idea to use all the old journals..The way u have written this article is simply adorable!! !me feel like getting this book for myself.. http://www.vivamagonline.com Superb post!!! I use a photo album also. It has dividers and a pocket in the front. I stick recipes I haven’t tried in the pocket. Only the good stuff that I know I’ll want to make again gets into the album pages, and I definitely make notes on the recipes. Not nearly as elegant as Lotta’s but it’s actually one of those organizational things that works for me.